Capturing your customers’ attention in a world that is bursting with marketing noise is a real challenge. If you are looking to cut through the competition in a convincing manner, digital signage solution (or digital signboard) is the perfect answer! Experience shows that creating an immersive brand experience is effectively achieved through smart digital signage solutions. High-resolution digital display advertising with a super-engaging content can boost your business opportunities. Here are two points to validate its staying power. 1. ‘Research and Markets’ has added Global Digital Signage Market – Forecasts and Trends (2016 – 2021) report to their offering. This implies the worldwide recognition of digital signboard as a brand-enhancing tool. The report says that the global digital signage market is expected to grow from $14.89 Billion in 2015 to $21.92 Billion in 2020, at a CAGR of 8.04% during the period 2015 to 2020. 2. Engaging our senses in meaningful ways is the purpose of marketing. When we compare the information, each of our senses processes, ‘sense of sight’ gets the top rank. A whopping 83% of the information our brains process comes through sight. Isn’t it an amazing reason to believe that embracing visual merchandising tools is really important? Being the most effective visual advertising method, we cannot afford to ignore Digital Signage solutions. Now, let’s have a quick look into how these digital displays can help in creating impressive brand experiences. Why is Digital Signage the Best Tool to Enhance Branding? Digital signage inside or outside the physical location of your business is an easy way to display marketing content to a wide audience. You can display multiple brand messaging and visual content like sales promotion videos, social media hashtag walls, etc. Remote content management and scheduling help you to effortlessly control multiple screens from a single location. Digital signage is the best way to make your brand visible, audible and experienceable. Creating meaningful digital signage content helps not only in catching consumer’s attention but also foster engagement and interaction with your brand. This engagement comes from the multi-angled effects these signboards impose on any sensible and sensitive human being. In-store digital signage is an effective tool to give valuable information and guidance about your products. You can highlight the products through captivating videos and content. You can even highlight complementary products that will enhance the usability of other pairable products. This will educate the shoppers about the potential purchases they can make. Shoppers, who like to shop without any assistance from salespersons, can be greatly benefitted with digital displays. They can get the required information to make well-versed purchasing decisions. Having electronic signages in multiple locations will definitely enhance your brand image and visibility resulting in more sales. Digital signboards are cost-effective when compared to traditional advertising methods like billboards and printed media like POS posters, catalogues etc. Though the initial investment may be more compared the traditional methods, digital signage solutions yield long-term savings. While the printed materials incur huge on-going costs to update and refresh content periodically, digital signboards incur minor maintenance costs. Besides being cost-effective, it also saves time! Digital signage is an effective marketing solution that gives immense flexibility to businesses. It helps in delivering customer engagement at the right time and at the right place in a seamless manner. Content updates can be done in an easy way at the press of a button. It’s easy to improve your campaigns as you need not worry about depending on anyone to update it across different channels (as with the traditional print and other marketing media like TV, radio etc.). Perfectly-customised dynamic content and motion graphics will drive more conversions. We, at Bridge Global, have vast experience in making digital signage solutions that engage, inform, educate, entertain and inspire relevant consumers. 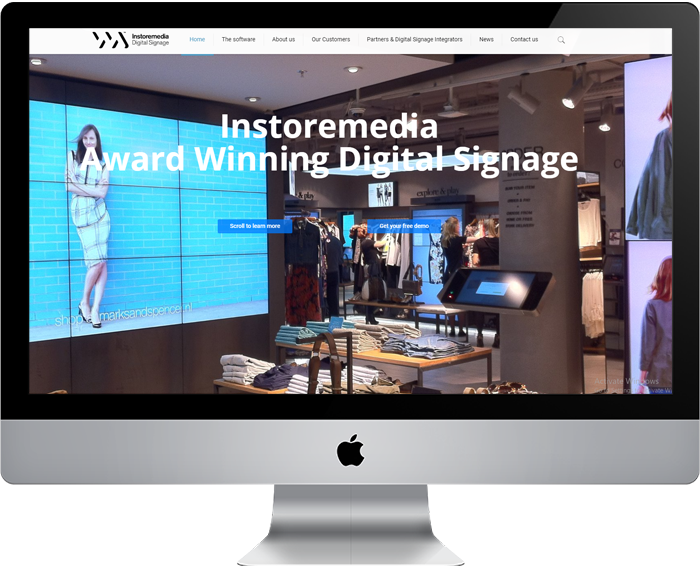 One of our clients, Instoremedia, a Swedish expert in developing Digital Signage Software, approached us to build a digital signage and media distribution platform. They wanted an Android app for the customer and a backend management system built on .NET. Our experienced Agile developers have built a digital signage solution to deliver in-location engagement. Our team worked along with their in-house team in a seamless manner. The digital signage solution contains features like kiosk mode, interactive media support, full HD media playback, live streaming support and analytics. We’ve also integrated advanced CMS, scheduling & template management. Being a valuable visual real estate, an engaging digital signboard can help you reap multiple benefits. If you are looking for immediate improvements in your current marketing and branding initiatives, investing in digital signage solutions is really beneficial. Feel free to contact us to give smart digital signage software solutions for digital signage displays, menu boards, interactive kiosks and other smart services.